The people who believe this misinformation don’t understand that the term “pit bull” can be used to group together dog breeds known as bully dogs. People also commonly use the term pit bull to describe the pit bull terrier breed, which is on the UKs banned dog breeds list. People often see these awful videos of staffy-like dogs attacking people and other dogs. But what they fail to understand is these dogs act this way because disturbed people mentally break them. In no way, does this define the temperament of all Staffordshire Bull Terriers. 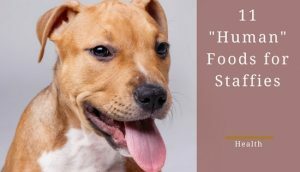 This article will outline the characteristics and temperament of an average staffy to help fight against this awful misrepresentation of this beautiful breed. In other words, describing what a staffy would be like in the hands of a proper owner who looks after and loves it. 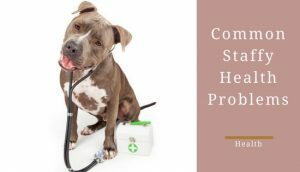 Before we get into the fun stuff like personality and activity levels, we must go over a staffy’s essential characteristics: coat colour, height, weight, and lifespan. 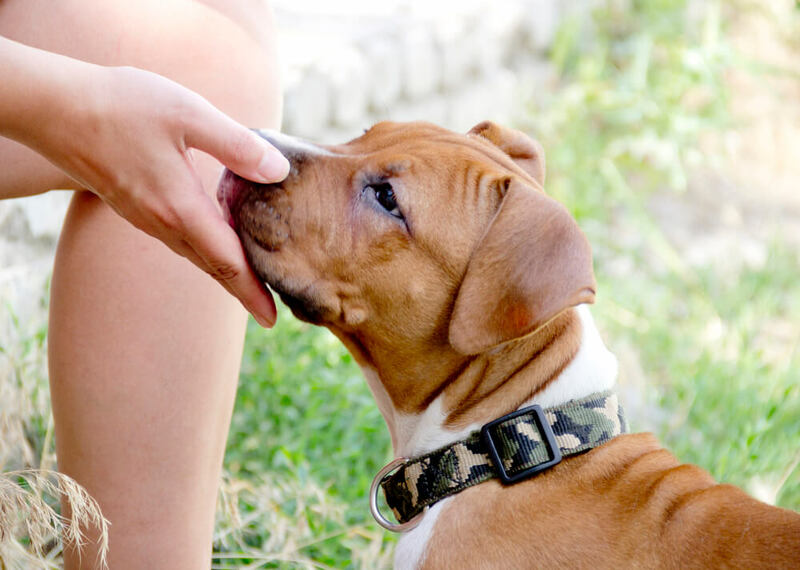 Understanding these attributes will help you prepare your home for a staffy’s arrival. 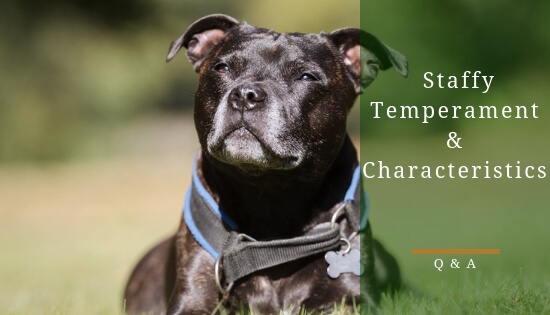 You can check out the guide for more information on what they consider desirable aesthetic traits for a Staffy. And it doesn’t end there; white and brindle coats are sometimes lighter or darker depending on the staffy. Overall, there’s no way you won’t find a staffy with a coat colour for your particular fancy. Staffies are relatively short with an average height range between 1 feet 2 inches to 1 feet 4 inches. This could be to your benefit as it means staffies are unlikely to steal things off the kitchen table or countertops. However, their jumping ability still makes them a threat to your food. So watch them carefully, or you might find your dinner missing a sausage or two. The recommended weight for a staffy ranges from 11 to 17 kilograms, (11 – 15 for females and 13 – 17 for males). Knowing the healthy weight range for a Staffordshire Bull Terrier helps curb a common problem for this breed: obesity. Staffies need a constant, rigorous exercise regime to keep their weight in a healthy range. If they don’t, they tend to overeat and lay around the house a little too much. Getting a dog is a long term commitment so it’s imperative you understand the number of years a staffy tends to live for: 12 to 14 years. 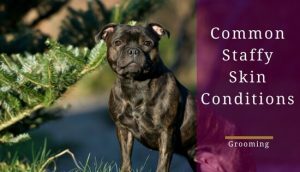 You can check out the Kennel club’s staffy breed standard guide for more information on what they consider desirable aesthetic traits for a Staffy. 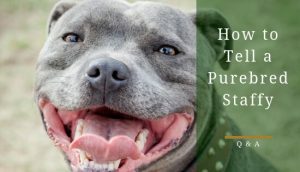 Now that you understand all the common characteristics of a staffy, it’s time to discuss their temperament, personality and why these dogs make the perfect pets. If you don’t think you’re this type of owner, there’s no need to worry. There’s a reason dog trainers exist. Contact one and let him or her aid your training process and guide you towards a successfully trained dog. The first thing you’re going to notice about a staffy is their very tough and rugged look. Their appearance embodies what it means to look powerful. But under this rough exterior lies the sweetest dog you could ever imagine. All these pups want to do is play and run around enjoying life. They’ll make sure they’re apart of any activity you’re doing: running, walking, reading a book, taking a nap, etc. They just want to be with the people they love. 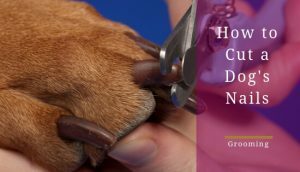 Due to this, staffies tend to get over-attached and develop issues such as separation anxiety: a condition that can cause some severe problems for both the owner and their dog. We recently posted an entire article on staffy anxiety problems. Besides being fun-loving towards their owners, these dogs will most likely get along with your other pets. However, it’s essential to continually watch their interactions. 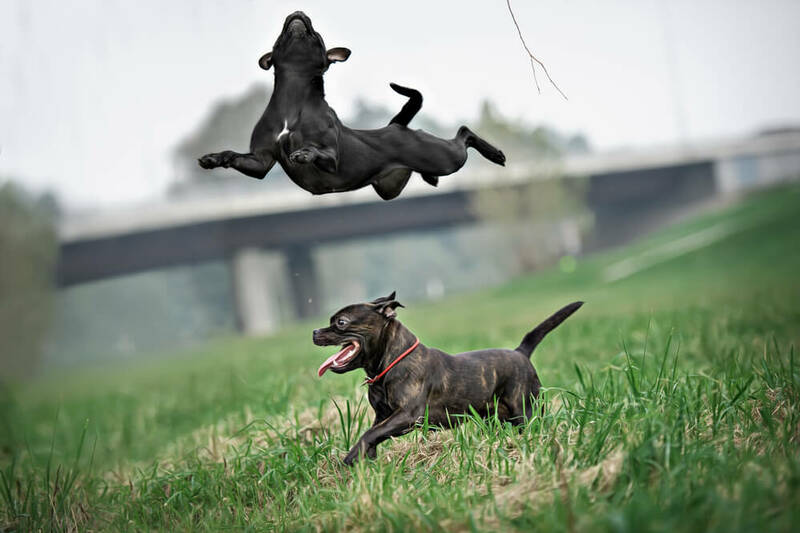 Staffies are known to be overly playful and given their strength accidents could happen. In light of this, think about the pets already in your home. For example, if you already have a dominant dog, a staffy isn’t a wise choice for a second dog. Staffies are a loveable breed but they are fearless as well and will fight if they receive a challenge. With this in mind you will want to be cautious when walking a staffy off the lead (this is the case with any dog, really). As mentioned earlier, other dog owners aren’t very informed about this breed and could be very standoffish or act scared towards them. In response, your staffy might become frightened and defensive towards the person or their dog. These fantastic dogs are seeking an owner to love them. If you take care of and train them properly, there’s no reason a staffy can’t make the perfect pet. Remember, don’t believe the misconceptions about them. They’re one of the best pets you could ever consider. ​Staffies are a very energetic, playful breed that needs a lot of attention and exercise. They love walks, hikes, runs, playing fetch, and any other physical activity you can possibly think of which can involve your dog. But given the opportunity, these dogs will lounge around all day. Allowing them to sit around and sleep will increase the likelihood they become overweight. They need a consistent, rigorous exercise regime every single day. 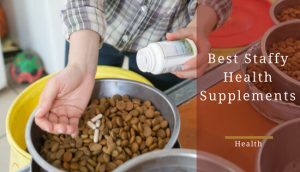 If you think that’s too much responsibility, there are other ways to get your staffy the exercise they need to stay healthy: invest in a dog walker, training classes or having a work from home friend take them on walks these are all things which could positively effect a staffy’s life and health. 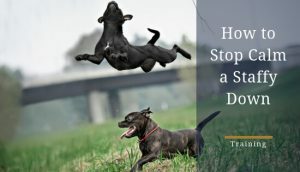 Here's a full article I posted dedicated to staffy exercise ideas. All staffy owners can agree on one thing: these dogs are stubborn. 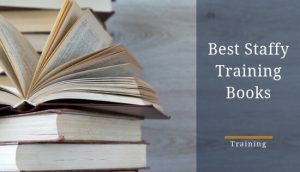 This stubbornness can make training them a challenging task a times. They’ll need an owner who’s confident, firm, and authoritative to train them successfully. Most importantly, these dogs need a sense of consistency for their training to take hold. Don’t expect a staffy to understand all the commands you want them to know immediately. It will take a lot of effort, patience and practice for you to train your staffy successfully. In the end, the Staffordshire Bull Terrier is one of the best breeds in existence. They’re fun, loveable, outgoing, smart and an owner’s best friend. Don’t let bad owners and misrepresentations in the media cloud your judgment of this fantastic breed! In fact, staffies are even listed by the Kennel Club as one of the breeds suitable for families with children.